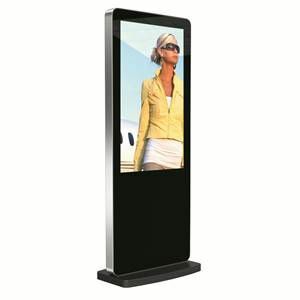 Introducing the new ranges of HD Slimline Freestanding Digital Posters; with their built in HD media player they require no additional hardware such as PCs, DVD players, excess cables or software. Simply load your media onto a USB stick, then plug and play.Their buttonless tempered glass frontage, rounded corners, super slim profile and aluminium frame all add to their eye-catching tablet like aesthetics.They support scrolling text to compliment your content and get your message across.Fitted with commercial grade panels they have a wide viewing angle, improved colour, contrast and brightness as well as the ability to be used 24 hours a day. With an eco-friendly power timer you can be assured of their green credentials and low operating costs.